Iowa Sen. Joni Ernst introduced legislation this week to ban "Meatless Mondays" from the military. Sen. Ernst--who represents the No. 2 meat-producing state--says that "our men and women in uniform should have the option to consume the protein they need, including meat, on a daily basis." But banning Meatless Mondays and promoting the protein myth is a disservice to service members, increasing their risk for obesity, diabetes, and early death. The military has seen a 61 percent rise in obesity since 2002, according to the nonprofit Mission: Readiness. Protein from meat is one of the causes. A recent study found that people who ate large quantities of protein and a small amount of carbohydrates were almost twice as likely to gain more than 10 percent of their body weight and experienced a 59 percent increase in all-cause mortality during the study. Of course, protein is an important nutrient required for the building, maintenance, and repair of tissues in the body. But replacing protein from animal products with a variety of grains, legumes, and vegetables can provide all of the essential amino acids our bodies require--without the risks associated with meat and dairy products. 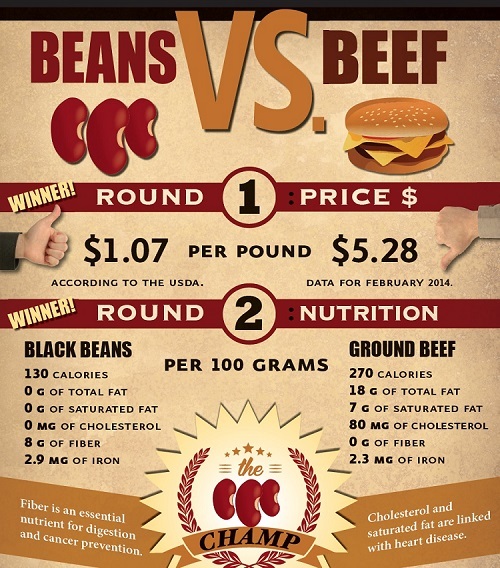 In fact, switching from beef to beans can actually reduce diabetes risk. A recent study found that those who consumed the highest amount of animal protein increased their risk for type 2 diabetes by 13 percent, but found that participants who replaced 5 percent of their protein intake with vegetable protein, including potatoes, legumes, and grains, decreased their risk for diabetes by 23 percent. Meatless meals can also mitigate the risk for early death. Another study found that people younger than 65 who ate the most animal protein had a 74 percent increased risk for death from any cause and a four-fold increase in death related to cancer. Risks for death were diminished or absent when protein sources were plant-derived. 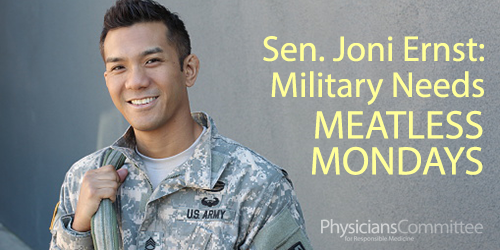 If Sen. Joni Ernst really wanted what's best for our military members, she'd mandate Meatless Mondays, instead of increasing their mortality risk with meat.